Saunton Sands is a huge sandy beach which stretches for 3 miles south. The beach is popular with surfers and parking and facilities are close to the beach. Update March 2015 - We have a report of palm oil being washed up on Woolacombe Beach. This is poisonous to dogs. Please exercise caution when walking dogs on beaches in north Devon. Rip tides by the cliffs. See Beach Safety Guide. There are 3 zones for dogs. Zone A is from the slipway north to the rocks and dogs are banned here. Zone B stretches from the slipway south for 1/4 mile until the red dog bin and dogs are allowed here with leads. South of the red dog bin is Zone C where dogs are allowed without leads. 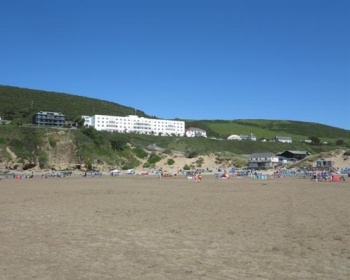 Saunton Sands is 41 miles from Bude and 48 miles from Exeter. There are various routes into North Devon. From North Cornwall take the A39 (North Atlantic Highway) past Bude and into North Devon towards Barnstaple. Approaching Barnstaple at the Lake Roundabout turn left onto the A361 (signposted to Ilfracombe). Alternatively from Exeter take the A377 and approaching Barnstaple at the Bishops Tawton roundabout turn west onto the A361 and continue on the A361 until Lake Roundabout and turn right to continue on the A361 (signposted to Ilfracombe). Follow the A361 over the new road bridge over the River Taw and then at the Braunton Road Junction turn left for Ilfracombe. Follow the A361 to Braunton and in Braunton turn left onto the B3231 signposted to Saunton. Continue on this road for about 3 miles to Saunton Sands. 1 large car park by the beach.